I asked a question here and egreg replied that the tabularx environment was not the right tool. He solved the problem with the tabular environment. Werner didn't use it either. In this question Mico also says that the tabularx environment is not suitable. I thought the tabularx environment was adapted to get columns of the same width, but this can be done in the tabular environment as egreg did. Is the tabularx environment useful? When should we use the tabularx environment? Do you have any examples where this environment is useful? Yes. But it's no environment intended to replace tabular with (i.e. it makes no sense to make every tabular a tabularx). You should use it when you need to calculate the width of a column with respect to a total width. Please note that if your columns are short and do not contain line breaks you do not gain anything from using tabularx. You can get fixed-width columns with regular p or wl specifiers. 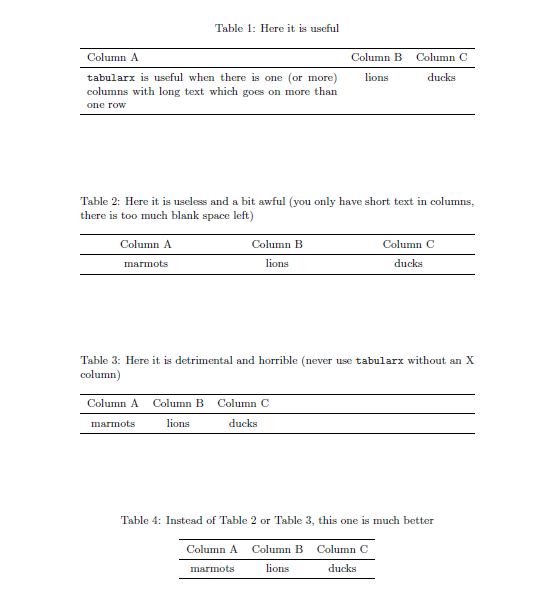 When you need to reproduce word processor tables it's quite useful as they are often using equally-sized columns. When you are going to have several columns which should be of equal-size and which will have line breaks. When you are in a hurry and do not want to do calculations. TeXnician already said when it's useful, I would like to add when it is detrimental. Never use tabularx without an X column! Sometimes I saw questions with this wrong usage here, never do that! The important thing to note about tabularx that it is all about automatically setting the target length for line breaking within a column. However the vast majority of data tables in scientific documents are (apart from the headings) tables of numerical data where there is no line breaking within the column, so I would say that tabularx is not suitable for those cases. An X column is a p column of an automatically determined width, but like any p column it is a \parbox designed for paragraphs of text wrapped to the specified width. Not the answer you're looking for? Browse other questions tagged tabularx or ask your own question. How to change only the color of numbers (and not units) with numprint? How to improve this table? What is the right way to set predetermined column widths with tabularx? How do I stop a table where the margin falls, rather than using the textwidth command? What options are there to globally format tables also allowing local overrides? How to change column width on each row? How to fix differents columns width with tabularx?